What is a Do Not Hospitalize Directive? A recent article points out how a potentially important directive is sometimes overlooked in the arsenal of health care directives. We’re used to planning ahead to appoint health care surrogates, powers of attorney, or issuing do not resuscitate (DNR) orders. But what about a do not hospitalize order? 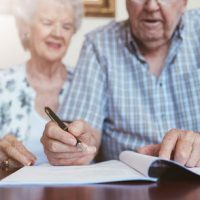 As the name sounds, the do not hospitalize (DNH) order is an advance directive that prohibits relatives or health care providers from admitting a loved one in the hospital if needed. It is often used for those in nursing homes or elder care centers so that staff there can be made aware not to hospitalize a resident in certain situations. What is the logic of a DNH? Many people feel that excess hospitalizations actually cause more harm than good. Families may not want to subject an older relative to the dangers that hospitalizations may cause. They may prefer to allow their loved ones to try to recover outside of a hospital rather than take the risks that hospitalization can sometimes have, such as illnesses that the elderly may be particularly prone to. Many also feel that hospitalizations can be very stressful for loved ones. They may prefer their loved one remain comfortable where they are rather than uprooting them from their normal environment and subjecting them to medical testing, all to possibly prolong the loved one’s life for what may end up being a minimal time period. This is especially true with those suffering from dementia or other cognitive diseases, where the relocation to a hospital can be particularly traumatic. A DNH doesn’t have to prohibit all hospitalizations. It can be customized to allow for hospitalizations in the event of traumatic injury, falls, excessive bleeding, or if necessary to minimize pain. They are most often used for patients who are deteriorating, such as those with dementia, or in the event of contracting pneumonia or sickness. DNHs also don’t mean that you are asking that your loved one doesn’t get treatment. Your loved one may still receive whatever medical attention can be provided in the nursing home. Many facilities are well equipped to handle a variety of medical ailments, and a DNH won’t prevent your loved one from getting treatment inside the facility. Like DNRs, DNHs are used when the patients themselves can’t make their own decisions. They aren’t meant to override a patient’s own conscious decision whether to be hospitalized or not. Just like any advance directive, it’s important to decide whether you will have a DNH when the patient or relative is still competent and able to make informed decisions about their care on their own. If so, you should contact an attorney because of the specific nature of a DNH. It is not a “one size fits all” directive. The parameters of exactly when you will allow a loved one to be hospitalized must be so specific that medical providers can follow them. Don’t leave important life decisions for the last minute. Contact Tampa estate planning and wills attorney David Toback to discuss a comprehensive estate plan for your loved ones.